Reopening the Smiler is not as simple as it may first seem, even when it has been determined as being safe. Alton Towers faces a huge headache on how to proceed with a ride which has been dogged by problems since its opening. If and when the ride does reopen, the level of scrutiny it will face from the media is extreme, not least from the relentlessly obsessive Daily Mirror newspaper. Given the Smiler’s track record of, from an engineering point of view, non-serious yet easily sensationalised incidents, Alton Towers will need to be absolutely certain that it is able to reopen the Smiler with no blunders whatsoever. 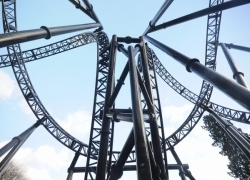 This means that Merlin Entertainments bosses will now certainly be speaking to manufacturers Gerstlauer very sternly, and demanding that the ride be able to run without further incident going forward. That means that incidents of the past – the loss of guide wheels and track bolting, plus track gaps – must be completely beyond the realms of possibility. The cracks that appeared in the concrete footers for the rollercoaster’s support feet must also be a thing of the past. The reality is that almost no imperfection, no matter how insignificant, can be risked if the ride is to reopen. The utilisation of a third party in Alton Towers’ design review of the ride, is another layer of protection for Merlin, as it looks to avoid further PR catastrophe. The question of how popular the reopened ride, be it re-branded or not, further strengthens the question of it being worthwhile. It remains to be seen whether that third party – and Gerstlauer themselves – are capable of convincing Merlin that re-opening ride is worth the financial risk. 19 Comments on "Editorial: The gamble of reopening the Smiler"
The popularity of the ride would be so low, at least initially, that one train may be enough to cope with demand! Personally I think that the ride will reopen, I mean looking at previous rollercoaster crashes, and of course, the PR along with it, they still reopened. Yes, this has affected Alton Towers and Merlin Entertainments, I was in the park a few days ago and it was calm, too calm for the season. But the question is, is it better to reopen once safe or close for good? It still is a record breaking rollercoaster, and I am confident that when the investigation is done and some reworking is done, the ride will reopen, with perhaps some bad PR, but if they make sure it is absolutely safe, and no incident will happen, that PR will die out pretty quickly, there are still enough people that will ride it nevertheless, and however you turn it, it is an 18M pound rollercoaster, THE rollercoaster that makes Alton Towers stand out most. I think and personally hope that they rework/fix the issues and reopen, I will ride it with no fear if they reopen it. Besides, bad PR isn’t always ‘bad’. Attention is attention, no matter how you twist it. I can’t see it reopening. The risk of adverse PR is too high, and in light of Merlin’s profits warning, there can be no further risk to share price. The removal of the ride will have very positive resonance with the media, and Merlin need that more than ever – brand reputation management is key to restoring long term consumer trust. The cost of this accident to the P&L way exceeds the investment in the ride. It will go and be replaced by something that is the exact opposite – tried, tested, not pushing the boundaries and very, very safe. I might be a roller coaster fan, but I’m also Head of Marketing and Communications in the UK and Ireland for a globally recognised consumer brand. Believe me, the product offering is almost irrelevant, it’s all about revenue, AOBIDA/EBITDA and share price. Thanks very much for your comment and insight. U havent lost me as a customer either, yes the accident was bad nd once in a lifetime occurance, whether it reopen nd b called something else i wil ride this ride again its awsome nd have so missed it in not in operation, we love alton towers. This ride has had way to many faults. If the ride was reopened and another fault was found there would be a public uproar and Merlin would suffer a major setback. The big question is, Why did the computer not stop the ride on its emergency stopping point halfway around the track (Just before the loop it went around before it crashed)? Was it on manual override?? + the staff operating it should not have let the manned car go round! So I personally would not ride it as this ride has proven to be unsafe and the operators not trained to deal with a fault in as safe way. Thanks very much for your comment, unfortunately we don’t have any answers right now! Thank you for your comment, however I believe you may have missed the point of the piece. There are huge potential PR implications unless they get it absolutely right. I think it will live :) yes it’s hurt custom but wait till Halloween/fireworks gate figures will be as was. They kill their own gate figures not always smiler related I think it’s part shutting the park at 5pm middle season 6 at the latest wow no wonder people don’t go, Thorpe park/chessi/legoland often manage 7pm onwards. I think it should reopen but there should be better safety tests! at the end of the day every rollercoaster you go on has the risk of break down or malfunctioning causing injury and people get on them regardless! I am a massive fan of rollercoasters and will be getting on it the next time I go to Alton towers if its running! Are we forgetting the girl who died on treetop ride and the incidents on the big one at Blackpool? Actually many people have, that is another disadvantage Alton Towers has – its super high profile in the public’s mind. I’m sure it is only a matter of time before the smiler opens again. Personally I think the cries of it being “a death trap” is a little ignorant and short sighted. The fact of the matter is its a one in a million accident… It will probably never happen again. If they put a car round the track tomorrow and asked me to test ride it I would gladly jump on!!! And as for the daily mirror well…. less said about that the better!!! Ashley, there are rides out there that have killed people that are still operating, so Im sure a couple of legs are not going to stop this ride. Yeah, keep it closed, and stop all cars on the roads, all airplanes flying, GET REAL…. THE REASON THIS IS NEWS IS ITS SO RARE… Get a grip and move on! I rode three coasters yesterday all which have previous record for accidents (one of them on more than one occasion has had fatal incidents), the park in question being Blackpool Pleasure Beach. Do I stop riding them, no I don’t!